Most of us work in a modern company whose survival depends, amongst other things, on how quickly we can release and update software. One might argue that this is only true for technology companies, but in reality, whether you are a financial, retail, manufacturer or healthcare company, you’re probably developing software to maintain your products, websites, mobile apps and more. To maintain a competitive edge, companies need to continuously develop new capabilities, quickly fix bugs and issues so as not to lose traffic, while rapidly resolving any security vulnerabilities. But creating new versions of software to manage these issues is only half the story. Once a software update has gone through all the development stages and is ready to be released to the world, you need a way to deliver that software to the compute edge – all those users, servers and devices that need the software updates – and it needs to easy, automated, and secure. The newly introduced JFrog Enterprise+ platform is the complete solution for covering all the steps involved in creating a secure, trustworthy, and traceable software release in a multi-site development environment. It is powered by the best of JFrog offerings with new innovative elements that work in conjunction with source code version control, and continuous integration and deployment tools. Let’s review some of the main challenges that DevOps managers tackle today. The many of players in the market, together with multiple software solutions, provide a multitude of possibilities. You want to pick and choose the ones that best meet your business needs, but each technology may have a different interface, REST API and its own package format. The only way to support these tools is to be versatile by going universal in how you manage your artifact lifecycle from creation to deployment. Companies are getting bigger, using more products and getting more dispersed across multiple sites and across continents. The companies’ users need access to all of these products from wherever they may be, and managing permissions and access control around this global ecosystem can get extremely complex. Wouldn’t it be great if users could sign in just once, anywhere, and then have just the right access privileges everywhere? To achieve confidence to promote your binaries to production, you need to be able to trust your artifacts at every stage of the CI/CD pipeline. This is because we know that vulnerabilities can be introduced at any stage of the development cycle. Bottlenecks and inefficiencies can turn up nearly anywhere in the pipeline, but currently, there is no way to identify where they are. DevOps managers need a way to gain insight into the pace of their delivery process and discover where and why processes are slowing down so they know how to achieve an efficient pipeline. A main concern relates to releasing the right binary to the right end-point in a secure and efficient manner. Currently, most companies use proprietary solutions which are neither robust nor secure, and are hard to maintain. 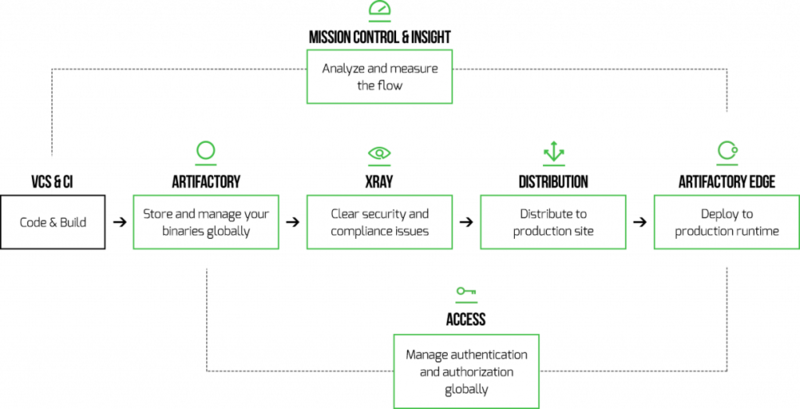 JFrog Enterprise+ fundamentally changes three aspects of your IT decision-making with respect to DevOps, all of which unlocks the ability for your company to address the challenges described above.